Killamarsh Secondary School. Mr Reid and prefects. Back row second left Jimmy Batterham 3rd left Jill Armstrong. Can you give the year. Sorry Roy not on Facebook don’t do social media stuff , tweeting nonsense & the like. Do you still live in Killamarsh (don’t think many old scholars do).I know a few do , Stephen Cartwright , Evan Davies & I think Kenny Revitt & Keith Bailey (all yr older than you). Didn’t mind it – I try to call my 14 year old son it but he resists! I suppose I had mixed feelings because as kids I was called Moggy Mouse because I was [still am!] small. But now we know that Moggy meant cat! I can put some of the names to this photograph but I’ll leave it to our followers at the moment. Are you on the photograph, do you know the name of anyone who is? 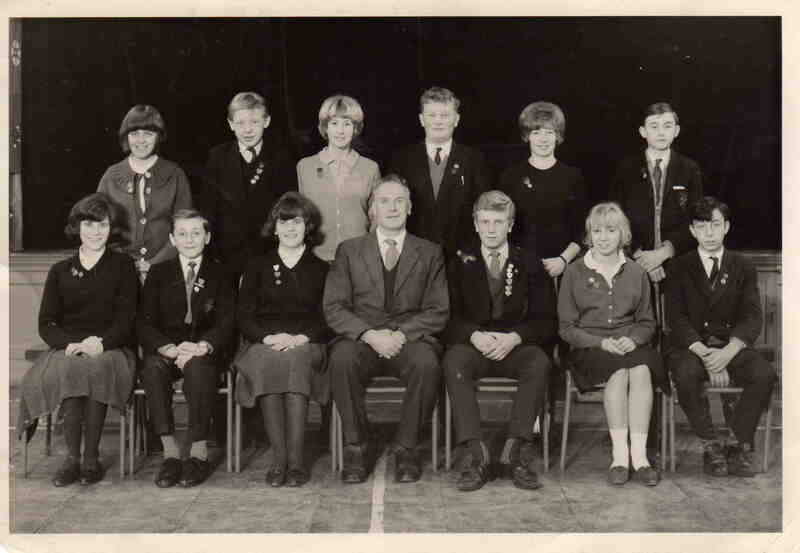 I think this is a photograph of the school prefects school year 1964/65. Joan Barker, Jimmy Batterham, Jill Armstrong, James Whitely, June Jackson, ?? ?